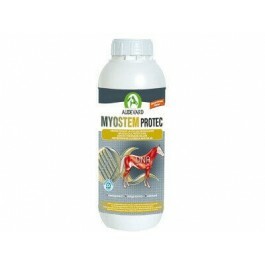 Myostem Protec is a complementary feed formulated by AUDEVARD Laboratories. It is designed to provide nutritional support to help boost muscle strength in sport horses. After exercise, muscle cells will be more or less damaged depending on the horse’s ability to manage the free radicals induced by exercise. In order to protect muscle cells from this phenomenon, known as oxidative stress, and for enhanced recovery, horses have two kinds of anti-radical defence mechanisms: enzymatic and nutritional, through antioxidant intake. The Myostem Protec formula is truly innovative, as it provides SOD (superoxide dismutase), an antioxidant enzyme present in the horse’s body, plus high concentrations of conventional antioxidants such as vitamin E and selenium. Provides antioxidants and amino acids for the protection of the muscles cells. Helps to boost muscle strength in sport horses. Improves endurance and recuperation after exercise. Does not contain any ingredients that could lead to a positive result during anti-doping tests and can therefore be used safely in all circumstances. 900ml - Sufficient for up to 30 days use in adult horses. Raw materials: Magnesium chloride, melon juice titrated into SOD ; Additives : 3a- Vitamins, pro-vitamins and substances with similar effect: 3a700 vitamin E 83,700 mg. 3c- Amino acids: 3.2.3 lysine 83,300 mg. 3b- Dietary minerals: 3b8.10 selenium (selenomethionine) 6.8 mg.
Analytical constituents: Humidity 57.70%; crude protein 10.00%; crude fats 15.30%; crude ash 2.80%; sodium 0%, magnesium 1.26%. Nutritional support to help boost muscle strength in sport horses. Shake bottle well before use. Give 30 ml Myostem Protec per day for 1 month.